Bose SoundLink Revolve+ is an updated version of Bose SoundLink Revolve. The sound performance of the speaker is excellent for the price. It’s ideal for your house parties or outdoor adventures. The size of the speaker is just perfect, not too small and not too big. However, it is bulky if you compare it with other speakers that are available in this range. The best part about the speaker is, it’s water resistant. You can use this speaker roughly for all your music playing sessions without the need to worry about water or stains. The sound of the speaker is deep and it gives 360-degree coverage. Therefore, with a loud volume, you can enjoy its full bass performance. The speaker has a dual mode and this is where it scores the highest. Bose speakers are known for powerful performance in sound. This speaker does not disappoint you either. The sound quality is amazing and you can enjoy every kind of music genre with it. Bose SoundLink Revolve+ is sturdy and truly durable. Even if you drop the speaker, the sound performance will remain the same. The audio profile of the speaker base may not suit everyone. Still, it will surely entice the music lover in you. The speaker is indeed a good choice for its amazing features. 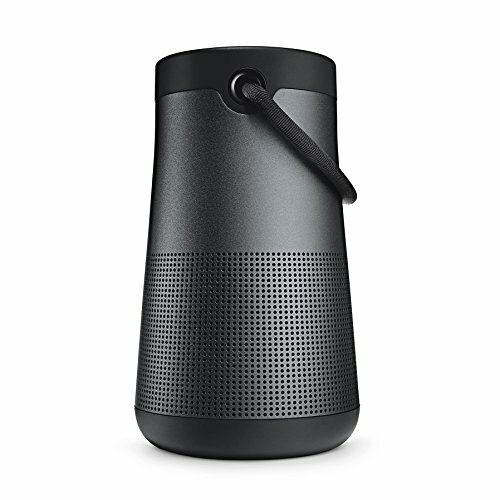 Bose SoundLink Revolve+ easily integrates and connects to various paired devices. It also features voice prompts to give you flexibility in taking your calls. It integrates with Siri and Google Now so you can access your music on the go. It’s ideal for a stereo mode and you can also play it along in your house party. If you are an outdoor person, then the speaker is indeed a great choice for you. Up to 16 hours of battery backup on full charge gives you a great listening experience for sure. The battery of the speaker gets charged quickly, so this saves your time as well. Bose SoundLink Revolve+ is purely designed for music. It delivers deep bass base and the sound quality of the speaker is simply amazing. There is no problem of distortion so you can enjoy continuous music. It also features 360-degree true sound coverage that gives you a great music experience in any setup. The sound is not only clear but it’s loud too. For a full balanced sound performance, you must consider this speaker. It’s waterproof so you can carry it along with you while traveling. The size is great so it will easily fit in your backpack. There are many great features of the Bose SoundLink Revolve+ speaker, let us look at some of them. Bose SoundLink Revolve+ has a deep and immersive sound base. True 360° speaker is designed to spread deep, amazing sound in every direction. Wherever you play this speaker, you will get the same kind of sound. It radiates and reflects in a similar way so the performance of the speaker is smooth. It features a flexible handle so that offers complete flexibility. The speaker features a highly competent transducer. It also features dual passive radiators. It has an acoustic deflector that simply means you will get realistic sound and it will definitely enhance your music experience. The sound quality of the speaker is awesome. Bose SoundLink Revolve+ speaker has a water-resistant design so you can play it along in a pool party or any outdoor activity. Now, you don’t have to worry about the speaker getting spoilt in the rains. Enjoy great sound experience in any weather. The portable wireless speaker needs remarkable battery life. The amazing rechargeable battery of the speaker can play up to 16 hours of nonstop music. You can enjoy your music all through the day without the problem of charging. The Connect app by Bose gives you easy access to your music. It lets you unlock all the product features and personalize your settings. It saves a lot of time in your set up so that is actually a great feature. The Bluetooth connectivity of the speaker is simply great. You can connect up to two Bluetooth devices and turn up the party mode on for loud music playback. There is a stereo mode for dedicated music playback too. The speaker features an optional charging frame that keeps your SoundLink Revolve+ charged and ready for music on the go. The speaker features voice prompts that integrate with Google Now and Siri. Bose SoundLink Revolve+ speaker features flexible fabric handle that makes it easy to grab it and use it while traveling. It also features a seamless aluminum body that is sturdy and water resistant. It can connect to a USB and wall charger. It’s available in two different colors, so take your pick. There is no major change in the design of Bose SoundLink Revolve+ speaker and it’s somewhat similar to the previous version. Still, it’s stylish in looks and sturdy. It features aluminum rubberized base and bottom. It also has a handy handle that helps you to grip the speaker for your ease of use. It looks heavy but its light in weight. It features all the controls on the top. The volume pairing and aux switch can be accessed with a tap. It also features a multifunction button that controls playback and voice assistant feature. The build quality is strong so even if you drop the speaker, it won’t really suffer in sound performance. The overall look of the speaker is good. Bose SoundLink Revolve+ speaker uses a full range driver that delivers full bass base with 360-degree audio. The sound is clear and crisp in any setup. The low-frequency range of the speaker is good. However, the mid-range frequency of the speaker can distort depending on the volume base. In the mid-range, the detailed texture makes a difference in the sound. The sound performance of the speaker in the high range is simply mind-blowing. Each beat is loud and clear even if you play your music loudly. There is no disturbance in the sound of the speaker and that makes it popular as compared to other speakers that are available in the similar range. Just like the design, the setup of Bose SoundLink Revolve+ speaker is quite simple. It features the control buttons on the top. There is a voice prompt feature that lets you integrate the speaker easily. The speaker features stereo and party mode. If you need to use it for your party, you can simply choose the party mode. The volume is loudest and there is no disturbance in the sound as well. The interface of the speaker is clean and there are no added controls. The 360-degree sound performance will simply blow your mind. The charging is also simple and quick. There is no difference in the tonal balance of the speaker and it’s almost similar to the earlier version. Still, the performance of this speaker is better because of its deep bass and great audio reproduction. It gives a warm balance of music with a great soundstage. So, it does not suffer in the sound department. Whether you play your music in monotone or full volume, there is no distortion in the sound. The audio is not only deep but also immersive. The speaker is compatible with all the Bluetooth devices. You can also connect it with two devices at a time to enhance your music experience. Bose SoundLink Revolve+ speaker has a good connectivity. It integrates with almost all the devices without any issue. It also connects through Bose app that lets you control all the features on the go. You can choose to play your music or simply change the settings of the music through the app. The app also lets you streamline your music through different sources. The battery life of the speaker is cool. On a single charge, the battery can last up to 16 hours. This is actually good if you need to play it for your party. The performance, however, depends on your music and volume. It has a good battery life. Low range sound is immersive. Sound can distort at times. Audio can strain at times. Bose SoundLink Revolve+ speaker is the best option in speaker right now. The sound performance is simply amazing and it can play your music loud and clear. The battery life of the speaker is also good. It has an immersive 360-degree sound so you can hear similar music irrespective of the place or the setup. The build quality of the speaker is good and looks wise it’s stylish. Actually, it has a very appealing design and that is what makes this speaker a popular choice amongst the young generation. The price of the speaker is on the higher side still it is a great buy.